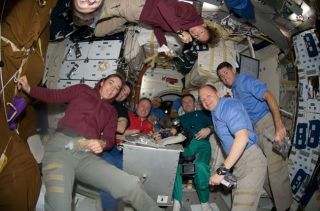 Getting all ten members of an aggregation consisting of seven Endeavour astronauts and three Expedition 18 crewmembers into a single photo wasn't easy as the two crews shared a Thanksgiving meal on the middeck of the orbiter. Astronaut Sandra Magnus, Expedition 18 flight engineer, appears at top center. Clockwise from her position are astronauts Shane Kimbrough and Eric Boe, along with cosmonaut Yury Lonchakov, and astronauts Steve Bowen, Donald Pettit, Michael Fincke, Gregory Chamitoff, Heide Stefanyshyn-Piper and Chris Ferguson. Space shuttle Endeavour returned to Earth on Sunday, completing a 16-day "extreme home improvement" mission to upgrade and service the International Space Station (ISS). The orbiter touched down at 4:25 p.m. EST (2125 GMT) at Edwards Air Force Base in California, after being diverted from NASA's Kennedy Space Center due to concerns over strong crosswinds and thunderstorms in the vicinity of the Florida landing facility. "Wheels stop, Endeavour!" announced spacecraft communicator Alan Poindexter as the shuttle came to a halt on the runway. "Welcome back, that was a great way to finish a fantastic flight, Fergie." "Hey, we're happy to be here in California!" replied STS-126 commander Chris Ferguson. Ferguson led his crew of six to a safe return after they worked together to expand the ISS from a three-bedroom, one-bathroom house to a five-bedroom, two-bathroom home. While docked at the station, they performed four spacewalks to clean and service the rotary joints that permit the outpost's twin solar array wings to track the sun and they delivered the station a new resident flight engineer while providing her replacement a ride home. "The crew of Expedition 18 would like to extend a congratulations to the crew of Endeavour and the entire team that made that incredible home makeover mission possible," radioed station commander Michael Fincke after watching the landing from on-board the ISS. "What a great crew and what a great team we have. We're really proud of everyone." Ferguson's "great crew" included pilot Eric Boe and mission specialists Don Pettit, Heidemarie Stefanyshyn-Piper, Stephen Bowen and Shane Kimbrough. ISS flight engineer Sandra Magnus launched with the crew on Nov. 14. Gregory Chamitoff returned in her place after working for six months aboard the outpost. The mission, which set several records including the 200th U.S. spacewalk and the longest joint operations between two spacecraft joined by open hatches, brought to the station two new sleep stations, a new galley with a refrigerator, a water recovery system and an advanced resistive exercise device. "We did somewhat of an extreme makeover," said NASA's mission management team chair Leroy Cain. "It certainly fits that category where we are concerned." Of particular importance was the delivery and installation of two equipment racks designed to recycle the station crewmembers' urine and perspiration into drinkable water. Working with ISS Expedition 18 commander Michael Fincke, STS-126 mission specialist Don Pettit spent several days troubleshooting the recovery system, before arriving with mission control at a configuration that would allow the urine processing facility to run without prematurely shutting itself down. Samples of the processed water were packed aboard Endeavour for post-flight analysis before the crew in space can start using the system for consumption. "The regenerative [water recovery system] is a very, very important system for us, not just for space station but for our future programs as well," said Cain. The recycling system's two refrigerator-size racks were among 16 transferred to the station inside the Leonardo Multi-Purpose Logistics Module, which launched and landed inside Endeavour's payload bay. The cargo canister was modified pre-flight to allow it to carry a record-weight of 14,400 pounds (6531 kg) of supplies. It returned to Earth with 3,642 pounds (1,652 kg) of equipment and station refuse. In addition to retrofitting the outpost's interior, three of the shuttle's crewmembers worked outside to repair and clean the station's solar alpha rotary joints (SARJ), the paddle wheel-like components designed to rotate the ISS's 240-foot solar arrays, to keep them facing the sun for the maximum production of electricity. Last year, flight controllers noted an increase in power consumption by the starboard SARJ, and it has seen limited use since. Over the course of four marathon spacewalks, STS-126 mission specialists Heidemarie Stefanyshyn-Piper, Stephen Bowen and Shane Kimbrough replaced the starboard joint's bearing assemblies and then lubricated both tracks on which the two SARJs rotate. The latter was accomplished using special grease guns, one of which leaked and led to the loss of a tool bag during the first outing. Although ground controllers need more time before they can gauge the results of the spacewalkers' work, initial indications were that the joints were moving more freely than before. Endeavour's touch down in California marked the 100th daytime landing by a space shuttle and the first use of a "temporary" runway constructed while the main landing strip was under refurbishment. "Congratulations on the first orbiter landing on Edwards' temp runway," commended Poindexter. "We have about 800 feet of it left, so we didn't quite use it all," said Ferguson, referring to the runway's 12,000 feet. The landing at Edwards Air Force Base will require NASA to prepare Endeavour for a return to Florida atop a Boeing 747 carrier aircraft. That process is estimated to take about a week at a cost of $1.8 million, but is not expected to have an impact on NASA's scheduled shuttle flights during 2009. Assisting their turnaround is that Endeavour may be the cleanest shuttle to return from space yet. "From what we've seen on-orbit from our inspections of this vehicle, Endeavour looks to me and to the experts to be as clean or cleaner than any vehicle that we've flown," said Cain. At 15 days, 20 hours, 29 minutes and 37 seconds, STS-126 was Endeavour's longest mission out of its 22 flights. The shuttle traveled 6,615,109 miles during its 250 orbits. Meanwhile earlier today, a Russian cosmonaut had to use a joystick to manually dock a supply ship to the space station after a glitch in the automatic system.